1- I want to insert a JTree() component in my GUI. What's strange is that I cannot edit the nodes of my tree, I have tree where the root is called JTree(), with three childs: "color", "sports" and "food", and each one of these nodes contains 4 leafs... I don't understand where it comes from! 2- Although Intellij IDEA says that we should not edit the $$$setupUI$$$ method :), I tried to do it so I can create my JTree() as I want, but when I run it comes back to the automatic generated code, and the changes I've made disapear! Anybody faced these -or similar- problems!? L> where it comes from! implementation and assign it to the tree from code. L> code, and the changes I've made disapear! class constructor), not in the generated method. I agree that you should be able to edit the Tree Model in the UI Designer -- the same way you can edit the the entries in a JList. The JFormDesigner lets you do that for JTable and JTree. 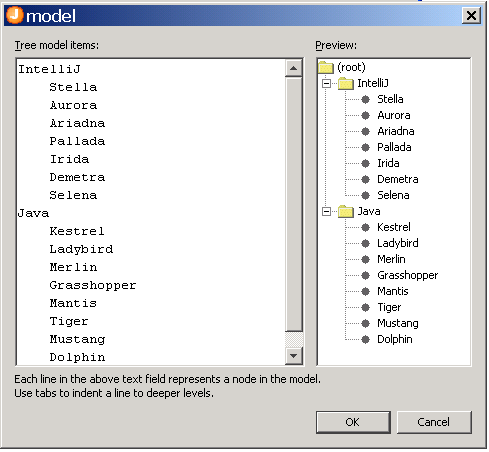 (See attached example of their model editor for JTree). The JFormDesigner model editor is great for doing quick and dirty mockups.